Previous postThe Los Angeles Angels Of Anaheim Are Coming To The Summit! Are You? My name is Randy Sullivan, and I am a recovering TWIT coach. For years my coaching style involved a traditional style that has come to be popularly known as TWIT Coaching. Oh, you haven’t heard about TWIT coaching? W: We Watch him do it. I: We stop Immediately Inform of all the things he did wrong. T: Then we Tell him how to do it better (sometimes demonstrating again while pointing out the most intricate details of the movement). If the player doesn’t get it quickly enough, we make him do punishment runs or pushups. If he still doesn’t get it, we label him “un-coachable,” and we move on, focusing our attention on the 10-20% who get better by random chance. Yes. I’m embarrassed to say that for the first 15 years of my coaching career I was a TWIT. It happened on the first day of the Texas Baseball Ranch’s Ultimate Pitching Coaches Boot Camp in December of 2015. Coach Ron Wolforth to challenge the status quo in coaching had hosted as a keynote speaker, Frans Bosch, the world’s most highly respected expert in biomechanics and motor learning. The room was full of nearly 200 coaches – men, like me, who had made our livings as TWIT coaches. We were all good men. Our intentions were pure and noble. We had all gotten into coaching to positively impact the lives of young men, and for all we knew, we were doing a good job. We were the “good guy” instructors, administrators, therapists and coaches who had the best interests of our players at heart. We had come to Houston in hopes of picking up a few nuggets of information we could take home to help us help our players. You could have heard a pin drop. The tension and uneasiness in the room were immediately palpable as coaches shuffled their papers and adjusted their posture. I was devastated, demoralized … and ignited to the soul. But soon, I saw the hope this new approach could offer. I rallied, shifted to the edge of my seat and began taking voracious notes, soaking in every syllable Mr. Bosch had to offer. When the lecture was over, I felt challenged and inspired like never before in my coaching career. I could barely sleep that night, my mind awhirl with ideas. The next morning I stumbled into the continental breakfast room at the Drury Inn and noticed Frans sitting by himself, quietly enjoying a cup of coffee while he waited for his ride to the airport, Trevor Bauer, to arrive. I introduced myself, and he invited me to sit down. Serendipitously, Trevor was late — 3 hours late actually – and I had the pleasure of discussing motor learning and skill acquisition with one of world leading experts for nearly four hours. I peppered him with question after question and sat riveted as he patiently answered every one. Looking back, I’m sure he felt like he was explaining calculus to a third grader, but he remained kind and gracious. Nonetheless, I saw the sense of relief in his eyes when Trevor finally showed up. That weekend in Houston back in 2015 changed everything for me. It was a flashpoint moment that forced me to realize and acknowledge that I was a TWIT. And frankly, it became clear that my TWIT coaching methods were inferior and ineffective. I resolved to do be better. I decided to study everything I could get my hands on and to do everything in my power to change my TWITtiness for the good of the families who had entrusted me with the development of their most precious assets – their children. My studies and travels over the past three years have afforded me the pleasure of forming professional relationships and friendships with some of the most knowledgeable and creative motor learning and skill acquisition experts in the world. Last April while visiting Frans and my friends from the Dutch National Baseball program in Amsterdam, we had a revelation. Wouldn’t it be great if we could gather all of the world’s leading skill acquisition experts and the most progressive-minded coaches for a weekend entirely dedicated to teaching, learning and applying the concepts directly to baseball practices and training sessions? The scientists could present the theory, and enlightened coaches could provide hands-on practical break out courses that would empower coaches, administrators and medical providers with tangible, actionable plans for applying the science. The idea quickly grew legs, and soon plans for the first annual Florida Baseball Ranch®/Dutch Baseball Skill Acquisition Summit were in motion. We are proud to announce that the most significant collection of experts in baseball skill acquisition ever assembled have eagerly agreed to be a part of this incredible endeavor. Frans Bosch, Rob Gray, Ron Wolforth, Martiijn Nijhoff, Paul Venner, Bart Hanegraaf, Dr. Stephen Osterer, and me, Randy Sullivan will present all the leading edge motor learning science, and then we’ll show you exactly how to fit it into your practices. To read the impressive bios of each speaker/coach click here. 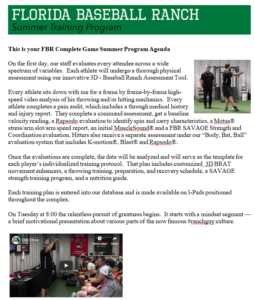 If you are a coach, instructor, physical therapist, athletic trainer, administrator, strength and conditioning coordinator, or motor learning student, and you’re interested in rising above the TWIT coaching approach, you can’t afford to miss this one-of-a-kind event. But you’ll need to hurry. Space is limited, and it’s filling up fast. The Early Bird Discount expires at 11:59 pm on July 18th. To learn more, view the agenda and register CLICK HERE! TWITs Anonymous meetings nightly at The Brass Tap! CEO, The Florida Baseball Ranch.